Learning to identify plants with confidence is by no means an easy task, although I do firmly believe that it is an innate quality that all humans possess, for without it we surely would not have survived the tens of thousands of years leading up to this point during which our species fully inhabited the wild. Before developing agriculture, permanent settlements and further advancements in our social system that lead to the detachment that many experience in relation to our understanding of the connection between food and wild plants, this skill was essential to our individual and communal success. The specific quality that I am referring to here is the means of which we observe, remember, recall, scrutinize and deliberate between the most minute of details in order to discern between delicious and poisonous. Identifying plants during the growing season can be tough, and certainly the winter months present their own unique challenges. For the most part, nearly all of the annual and perennial species that we observe during the growing season are either hiding dormant underground away from the elements or any remnants of their being there at all are buried in snow and ice or dried up beyond recognition. This leaves large, woody ‘megaflora’ species such as trees and shrubs as the group of plants that are most obvious and recognizable in the winter landscape. During my last outing in the woods which you can read about right here, I decided to capture some images of tree trunks with each species bark displaying it’s own characteristic colors, textures and patterns. The bark of trees and shrubs, in addition to their buds, twigs and any remnants of fruits or seeds is usually all that the passerby has to use in order to differentiate species from each other and often, if a specimen is particularly tall, bark (as well as perhaps the growth form and architecture) is the only clue that you have. 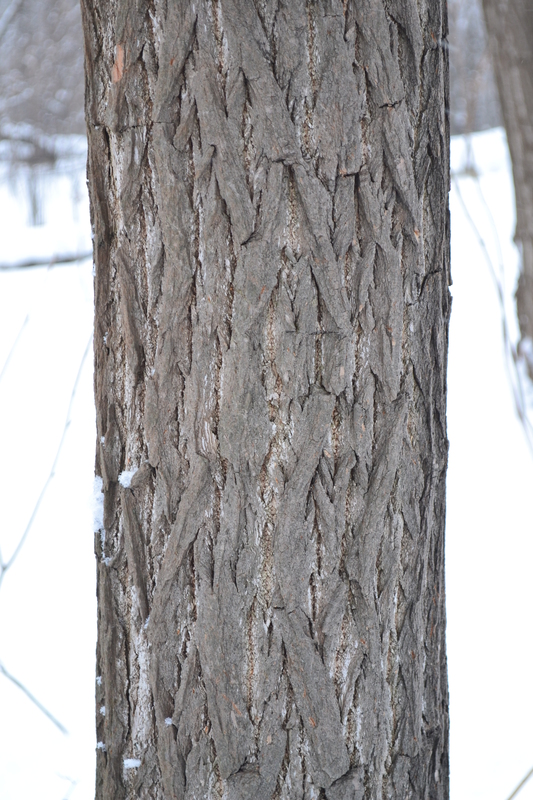 Although from a distance all bark tends to look the same, one can train themselves to look at this protective layer around woody plants critically enough so as to notice certain key features. This is by no means a complete list of all the species that you should expect to encounter, however these are certainly some of the species that one could find in a forest in southern or south-central Ontario if not elsewhere in eastern North America. Be sure to look out for future posts where I will address a collection of other species. Red Oak (Quercus rubra) – The red oak is usually the most common oak species in southern Ontario. The bark of young trees is often completely smooth, sometimes to the point of even being considered shiny, and only begins splitting well into maturity. The shallow ridges appear as if someone has run a wood planer over them. Narrow orange-brown cracks develop in between these ridges which deepen with age, becoming blocky only on the lower trunk or the buttressed boles of older specimens. Occasionally there are two or three trunks all emerging from the base of the tree at ground level. Ironwood or Hop-hornbeam (Ostrya virginiana) – Ironwood is a fairly common small understory tree which is found throughout southern and central Ontario. Trees grow quite slowly and succeed in the dappled shade of mature forests, often comprising the lower canopy of deciduous woodlands. The bark of young and old trees alike is composed of thin, narrow papery strips of light colored bark which often curl and becomes quite loose at the top and bottom ends, especially on branches. Pure stands are the norm, and where there is one there is likely be others, usually sharing the understory with other species. 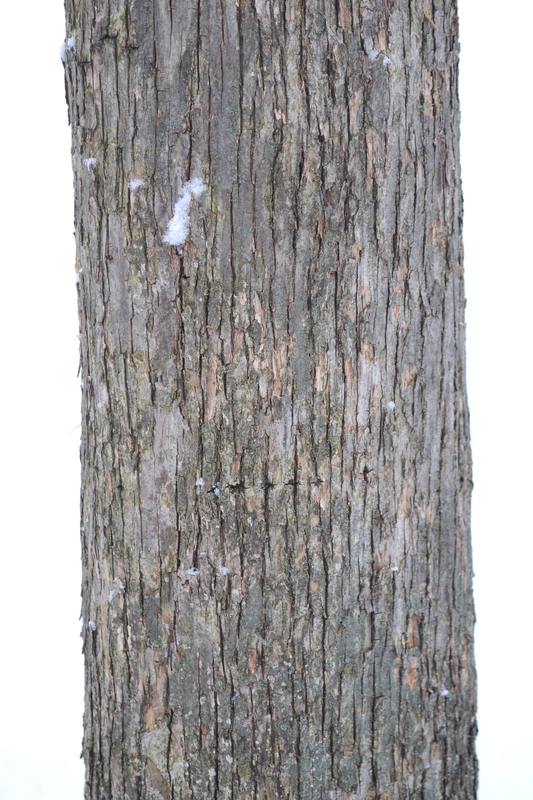 White Ash (Fraxinus americana) – White ash is another common hardwood species that is also occasionally planted in urban environments as a street tree, although the closely related red ash (F. pennsylvanica) is more commonly planted for this purpose. Both species are being heavily affected by the devastating impacts of the emerald ash borer, a non-native insect which is reducing the number of large trees in our forests and jeopardizing their continued survival. Mature white ash has light colored and deeply furrowed bark with heavily angled, tight interlocking ridges which form characteristic diamond-shaped patterns. Red Maple (Acer rubrum) – If you live anywhere in eastern Canada except for perhaps the far far north, you are very likely to encounter red maple. It has one of the largest ranges of any other North American tree, being found from Newfoundland in the north to Florida in the south. 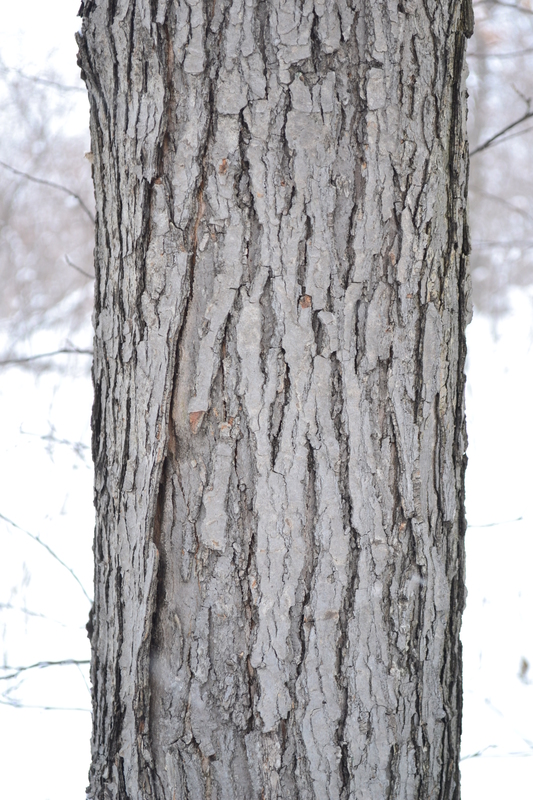 The bark of red maple is light to dark gray in color and comprised of relatively woody plates which thicken with age and interlock and overlap each other and peal from the ends as well as the sides. Young trees often have perfectly smooth light gray bark which cracks and splits before developing the plates found on nature trees. Sassafras (Sassafras albidum) – The sassafras is a southern Ontario specialty, a fast-growing aromatic broadleaved tree which tends to form pure stands and bully it’s way into established forests or invade open meadows. The bark is a light brown/gray and quickly develops tough, broad interweaving ridges which have distinct longitudinal breaks in between them and somewhat lighter, rusty patches in the gaps between the ridges. 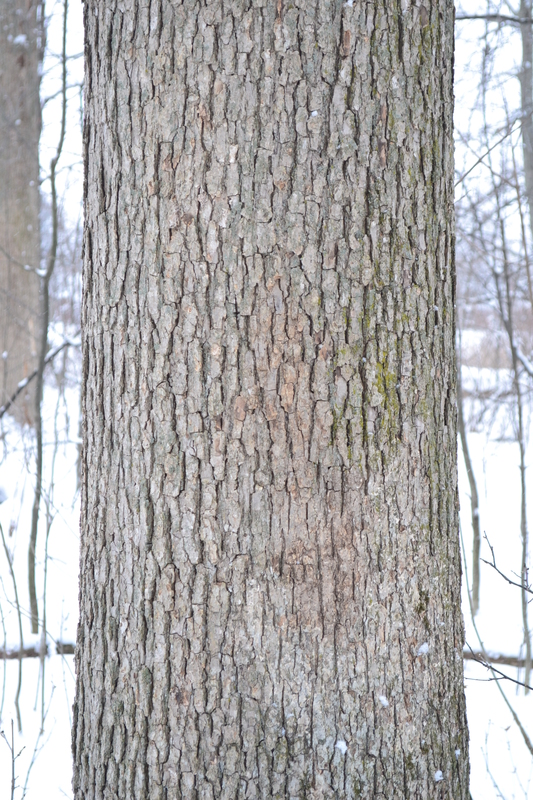 Trees also have a habit of ‘corkscrewing’ their way through the undergrowth into the canopy and the trunks are rarely straight as is seen in oak, maple, hickory or other species sassafras often associates with. 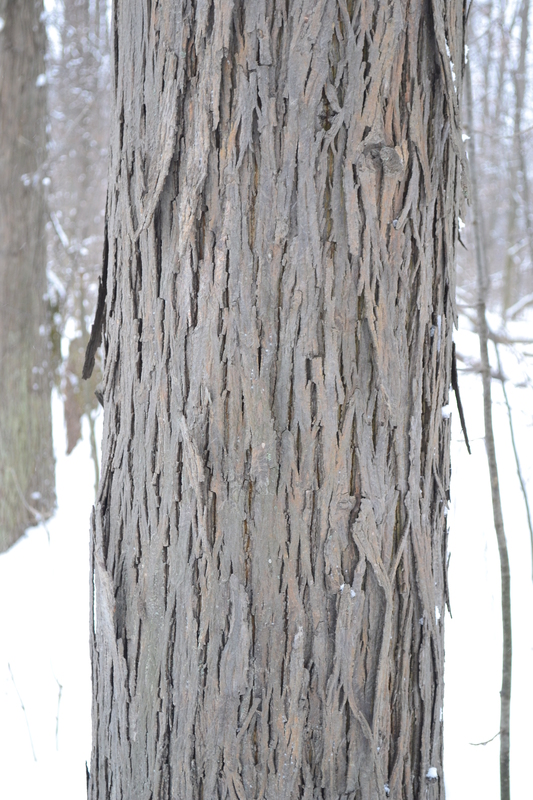 Shagbark Hickory (Carya ovata) – One of my favorite deciduous trees, and another feature unique to southern Ontario and parts of Quebec. 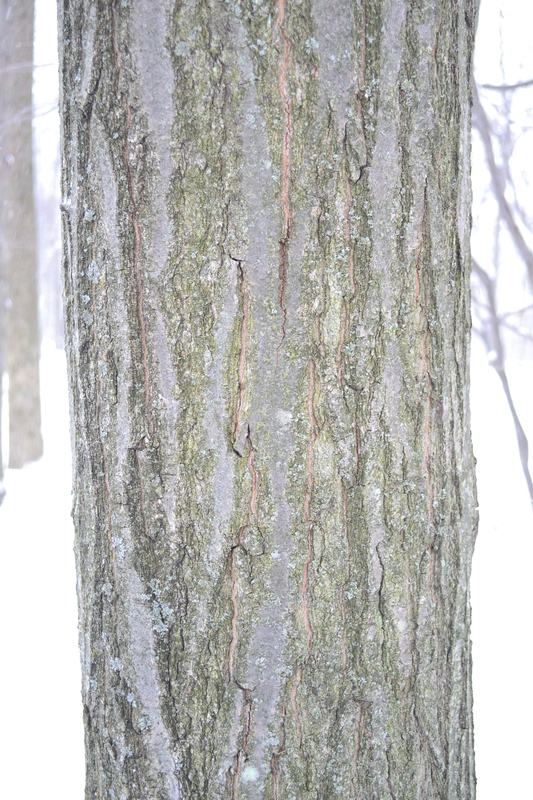 From a very young age the bark develops into long, interconnected strap-like peeling strips which often become detached at both ends and curl away from the trunk, exposing smooth patches underneath. This feature is often more evident if one looks up into the canopy of the tree where sections of peeling bark can be seen from below in contrast with the sky. Insects benefit greatly from the shelter provided by the peeling bark, and even bats are known to roost among them at night. White Oak (Quercus alba) – another common oak species, the white oak is perhaps the most characteristic of the lot due to it’s chalky-white, light gray bark which on mature trees is broken up into rough, squarish blocks. Occasionally the bark on some specimens doesn’t develop this pattern but instead is comprised of longitudinal sheets which peal away from the trunk from the sides. Some trees even have both types of bark growing side-by-side which adds to their interest and dynamic developmental behavior. 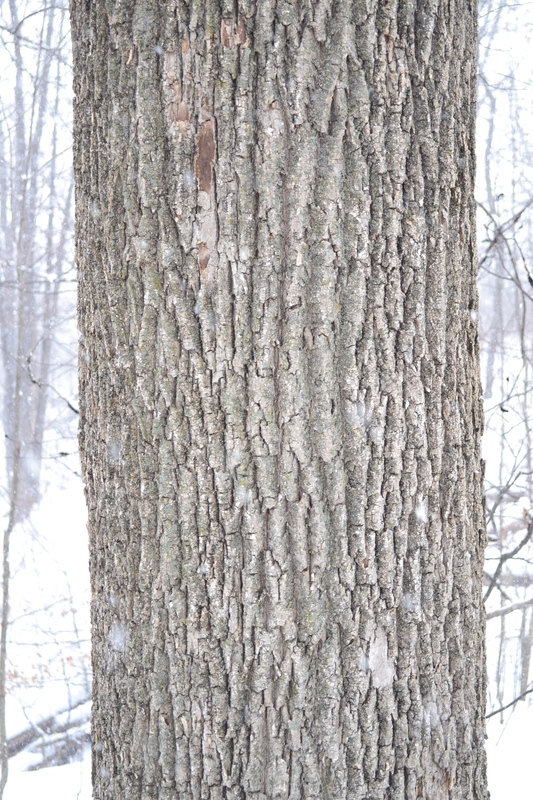 White oak often grow together with other oak species, beech, hickory and maple in moist uplands forests.